So much more than just an inspiration shoot, this bridal editorial is a love story. You see, our bride and groom models, Kyle Roedersheimer and Satahi Bevels, are actually engaged to wed this coming June! After graduating from universities on opposite coasts, the couple first locked eyes on day one of an intensive Teach for America training program in Tulsa. Some time passed, and the duo planned a super secret first date to “figure out if there was really something there” on the other side of town and without telling a soul – just in case! Naturally, they then spent the next four weeks together before venturing on to their respective programs, Satahi’s teaching assignment in Miami and Kyle’s first year of medical school at Chapel Hill. Nearly four years later and just prior to moving to Charlotte for Kyle’s emergency medicine residency program, he proposed. When we were trying to decide where we wanted to be for Kyle’s residency, we played with the possibility of going several places. When we “ranked” our preferences, we realized that we may not be in Charlotte for the long haul. We made a bucket list of all of the places in North Carolina that we wanted to go together before we left. I had never been to Wilmington, so I booked a trip the week before his graduation. At the last minute, we ultimately decided to move to Charlotte. When we found out that we were going to stay here, I suggested that we cross Wilmington off of the list of activities to do before his graduation as we were tight on money. Kyle was adamant that we keep the trip. He booked an AirBnb, and confirmed kayaking for Saturday morning. During this time, he was doing an “away rotation” – which meant that he had spent the entire month at a hospital in Chapel Hill. We both drove separately and met in Wilmington on Friday. He said that the only thing we had planned on the trip was to go kayaking. Let me preface with saying that that’s very unlike Kyle. He typically has a very clear outline of what he wants to accomplish every single day, so for him to say that, that was really surprising and kind of exciting for me (and baffling). We got up that morning, jumped into our activity clothes, and set out for the canal. I remember seeing him wear a bright orange fanny pack and making a teasing statement about how ridiculous it looked. He told me that it held some apples and almonds for us to snack on just in case we got hungry along the way. Kyle is typically a really safe guy. He doesn’t love heights, he doesn’t enjoy scary movies… and so when he wasn’t going into the center of the canal (where the water is the deepest), I didn’t think anything of it. I on the other hand LOVE thrill – I love heights, roller coasters, and any scary movie that doesn’t include demonic possession. So naturally, I was in the center of the canal where the water is the deepest and choppiest, continuing to tease him for hugging the shore so closely… I obviously had no idea what was in the fanny pack. As I turned around to yell him, he said my full name, and I nearly fell over. He was behind me on a bended knee in the sand, and had the most precious look on his face. Everyone asks me if I cried. Yes – I cried. But not initially. Initially I was confused (let’s replay the events – he was wearing an orange fanny pack, peeing in the woods, wouldn’t show interest in the water bugs, asked me if I wanted an apple, and then popped out a ring instead). What made me cry was when he told me that he had called my parents, sisters, and his family the week before! Everybody knew that it was going to happen soon, but nobody knew that it was happening that weekend. And that he wanted this weekend to be only about us… That he didn’t want us to post anything on Facebook or social media until we got back home… That he wanted the weekend to have me to himself uninterrupted by the masses… That he loved me and that this moment was intended for only us. Needless to say, he had the rest of the weekend planned to the T. We left the river, went to have lunch on a pier that had champagne and a secluded space. We had dinner on a private balcony on a restaurant overlooking the river, and then we spent the next day laying on the beach. It wasn’t a grandiose engagement with people popping out, marquee scrolls, or flashmobs – but it was definitely the perfect engagement for us. Fun, silly, adventurous, and just between us. I couldn’t have imagined anything else as perfect! The style shoot, set in Craggy Gardens at the very top of the Pinnacle Trail and captured by Megan Burnett of Milk + Honey Photography Co., is just as adventurous! The overlook is just twenty minutes beyond Asheville, North Carolina and several miles deep into the Blue Ridge Parkway. Expect to find exposed rock faces and herds of deer or elk, but be wary of a possible bear sighting or two. Bouquets of red berries known as mountain ash flourish in the balds – open spaces where wildflowers blossom throughout the spring and summer and give way to otherwise barren fields in colder months. Still, sweet clusters of daisy and aster flowers remain here or there. The table, clothed in an understated yet elegant champagne satin, holds quite the eclectic arrangement. Crisp greenery of English ivy and asparagus fern creates a narrow yet lush runner spanning its length. Mod wood chargers echo the squared corners of the porcelain. On each plate is a delicate sprig of fern and a single buckeye nut; both species are native to Appalachia. Adding further contrast to the luxurious satin and the angular place settings are rustic, weathered bentwood chairs with a solitary nail at each joint. Dark cerulean and royal purple candles stand in classic gold holders, playing to the bold menus tied with sinew and sealed with gilded wax. And the crescendo to the perfect rustic tablescape? Hand-blown goblets, as crafted by artisan Hayden Dakota Wilson of Asheville, which refract light, distorting the deep hues of their plush wine pours. The stemware is paired with a delicate decanter clad in careful Swiss dots. As for the paperie? Deep blue envelopes and menus anchor the otherwise airy suite. Modern hand lettering, all lowercase, is scribed in gold. Watercolor mountains dotted with trees reach across each invitation, and the peaks play to the torn, raw edges. 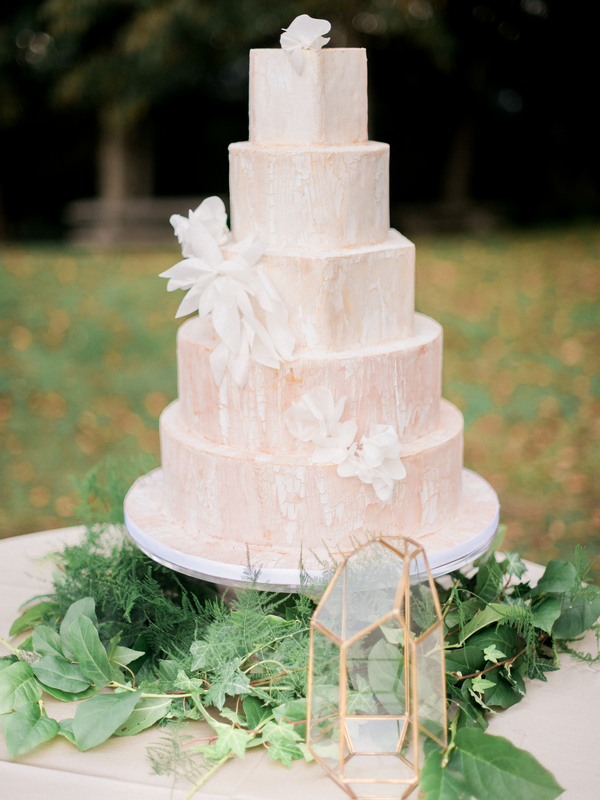 The five tiered cake, designed by Wow Factor, boasts a deep blush and a tonal ivory. It features a spray of geometric wafer paper flowers along with modern, hexagonal tiers. Moreover, its statement-making crackle finish with peach undertones is surely unique. The English ivy and asparagus fern joins seeded eucalyptus in Satahi’s bouquet, and the greenery frames luscious pale pink cabbage roses to create contrast. Sprays of delicate chamomile don’t take themselves too seriously, adding whimsy. Finally, a few star of Bethlehem buds – a sure nod to the season – peek out, proving a bit more collected than their bouquet-mates. Our bride’s bouquet is finished with a hand-tied assortment of blush, dark rose, and rich gold satin bows. Kyle’s boutonniere features a solitary oversized rose with furling petals, and a quick tie of the honey-toned ribbon finishes the understated adornment for a cohesive look. Satahi simply floats in her Justin Alexander ball gown. The heavily beaded corselet features a classic sweetheart neckline and a natural waist. The careful pleats contrast with the organically cascading tulle – the edge of which is finished in glistening crystal beads. Though sleeveless and pastel (or “sorbet” to be exact), the regal nature of this dress and unlikely hue lends itself autumnal. This is especially true as paired with Kyle’s dapper deep blue suit with its wide black peaks.